The clinical signs of Senecavirus A can resemble some swine vesicular foreign animal diseases. If clinical signs are seen at border crossings, this can prevent export and if clinical signs are seen at abattoirs (cull sows or market hogs), this can result in temporary shutdown of processing. The following document has been prepared by Swine Health Ontario and can assist you in identifying the clinical signs associated with Senecavirus A and provide recommended actions if clinical signs are seen. In today’s increasingly competitive marketplace, downstream flexibility can be achieved in part by predicting and managing upstream risk. This comprehensive, three-day course focuses on practical application and is essential for any farmer or agri-business leader whose production (outputs) or raw materials (inputs) are commodity based. March 1, 2014, but down slightly from December 1, 2014. Breeding inventory, at 5.98 million head, was up 2 percent from last year, and up 1 percent from the previous quarter. Market hog inventory, at 60.0 million head, was up 8 percent from last year, but down slightly from last quarter. 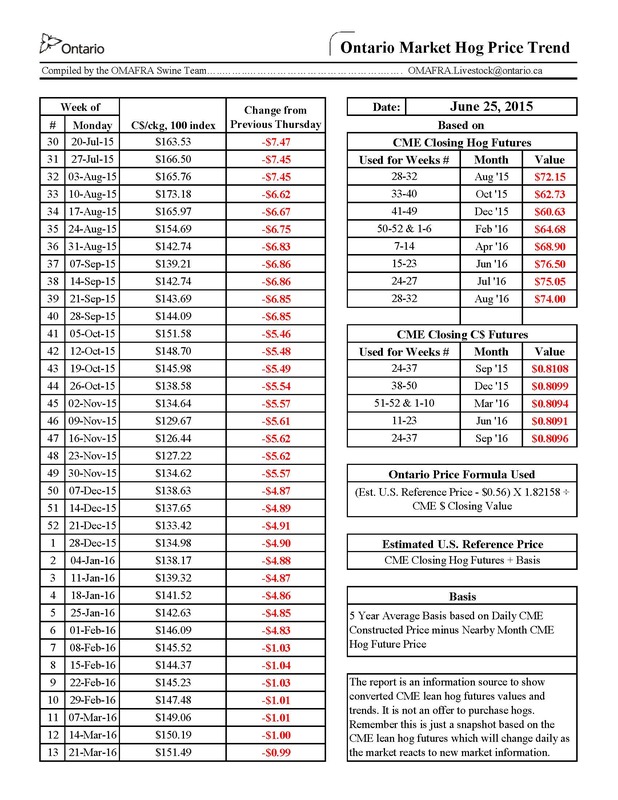 · The Ontario Base Market Hog Price is averaging $182.81/ckg, 100 index, down $7.78/ckg from last week’s average. Downward pressure is from a lower CME Constructed weekly average price of US$88.76/cwt. (down US$5.17/cwt. from last week) but support is coming from a lower Canadian dollar weekly average of 88.78 cents (up 1.36 cents from last week’s average). · The USDA Pork Cut-out Value is averaging US$96.50/cwt. which is down US$2.01/cwt. from last week’s average with all primals being down except for ribs. · US slaughter has averaged 2,173,527 the last three weeks but remains 4.4% below last year for the same weeks. Dressed weights averaged 212 pounds the last two reported weeks which is 5.5 pounds above the same weeks last year. · Ontario market hog sales year to date continue to be up 2.7% over last year. First quarter sales were up 2%, second quarter up 5% and third quarter is up 2.8%. Dressed weights for the last 2 reported weeks have averaged 102.5 kg. · Current daily movement in the pork cut-out, cash price and nearby futures indicate next week’s price movement will be down. 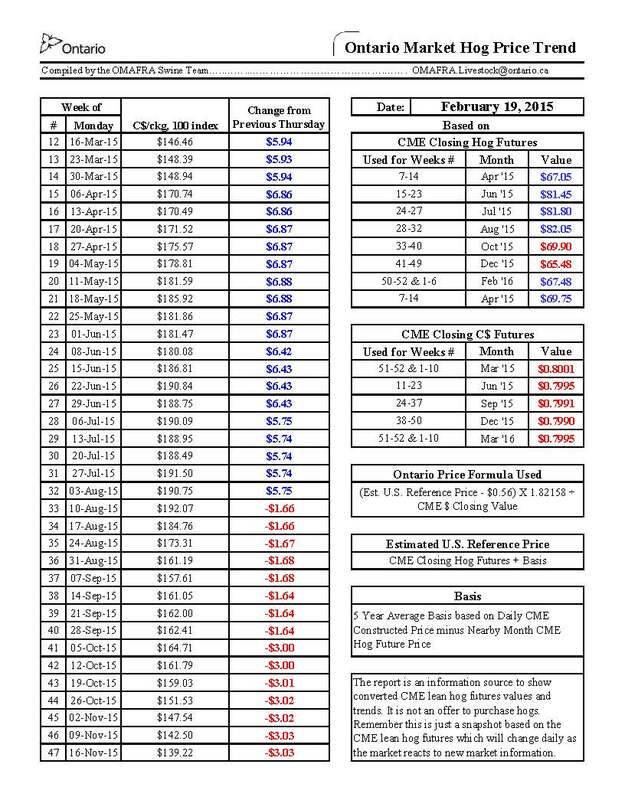 · CME Constructed Price – US$88.07/cwt.